We did not get up exactly early, I will give you that. By the time we got to the ferry terminal in Split it was almost 11 am and we were not very confident about being able to catch the ferry leaving at that time. I stopped the motorbike on the taxi rank in front of the ticket offices, right under the nose of four traffic wardens ushering cars onto the ferry boarding area and making sure nobody stopped there, but they did not seem to mind me. Nat went to get the tickets and she came back running, saying they had told her we still could make it onto the 11 am ferry if we hurried. I rode onto the boarding yard and up to the man checking the tickets. There was a queue of cars boarding, but when I asked him if we were on time, he asked whether we had tickets and when we said we did he just pointed at the ferry’s ramp and said ‘bye-bye’. I rode straight onto the car deck, jumping ahead of all the cars that had not boarded yet, but nobody seemed to care, that is another of the nice things of riding a bike. We parked it on one side, the crew strapped it down for the crossing, and we walked up to the top deck as the ferry started slowly moving away from the city. It was a gorgeous day and the city looked amazing from the sea. 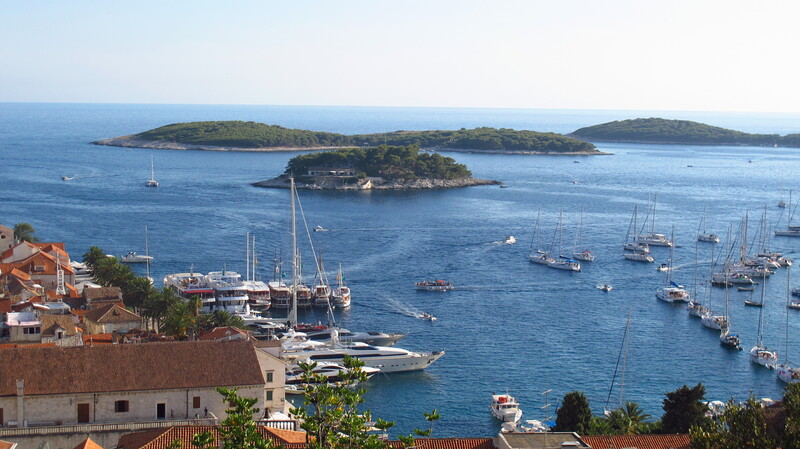 There were several ships connecting the islands to the mainland, but the ferry only went to either Brac or Hvar, so we had had to choose. 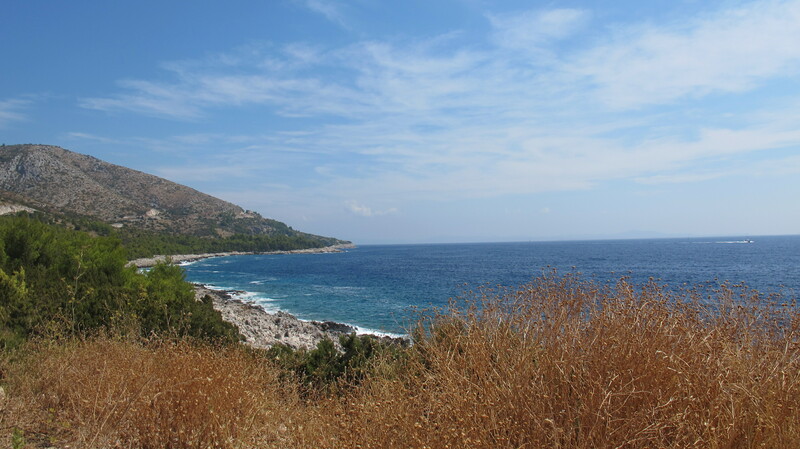 We had been told that the nicest one was Hvar, and also the one with the best beaches but once there it was hard work finding one, as the coast was mostly rocks. The landscape was beautiful, though, very small towns with stone houses, a very narrow road that went up and down hills and valleys and the island had very little population and even less tourists. We stopped at a small town with a quiet pebble beach and sunbathed for a while and went for a swim. The water was quite different there, it was open sea and you could tell that there was no longer the protection of the islands in front of the coast. The waves were higher and the color was no longer crystal clear, but a darker shade, due to the seaweed that was stirred from the bottom. We stayed in the same town after the swim and had fish for lunch at a restaurant with a lovely terrace by the beach before heading to the town of Hvar, where we visited the fortress on top of the hill and enjoyed the views from there. After that we rode to the highest peak in the island, where there was an observatory, I imagine that out in the sea and with so little population, the night view of the sky must be amazing from that point. It was getting dark, so we started heading for the other two main towns in the island, but after seeing that there was not much to see after dark in the first of them, we decided to head back to Stari Grad, where the ferry terminal was, and try to catch the 8:30 ferry, as there was not another one (the last one, in fact) until almost midnight. By the time we made it to the docks it was a few minutes past departure time, but the ferry was still there with the doors open and two of the crew members were standing there. A couple of cars were still boarding, so I rode directly to them and asked whether we could get tickets on board. They shook their heads and pointed toward the terminal building, indicating that we should buy them there. I rode across the yard and Nat ran to the offices while I waited outside on the bike. There was one last vehicle that still had not boarded, about twenty meters from where I had stopped on the opposite end of the yard from the ship. It was a knackered old blue van with a couple of men that looked like a mix of old hippies and gypsies, and by the looks of it, it was them the ferry was waiting for when we had arrived. An old woman on crutches approached them, she had gone to the building to get the tickets, but when they tried to start the van, the engine would not fire up. They tried again and again, but it was not working. While they were trying to get the van started, the old woman stared to slowly make her way across the yard with the tickets in her hand; Nat was not back with our tickets yet and the two men decided to push the van into the ferry and at that moment a weird race started that looked like something out of a Cohen brothers film. The woman was limping two thirds of the way across the yard, the men had already pushed the van about a third of the way and out of the corner of my eye I saw Nat come out of the offices with our tickets in her hand and start to run towards the bike. She gave the tickets, which I put directly in my mouth while I fired up the engine and she jumped on the back. I revved the engine up and shot across the yard just as the old woman was handing the tickets to the crew and the two men were approaching the ramp with the van. I stopped right in front of them, handed the crew our tickets – bite marks included – and rode onboard a half-empty ferry which started closing the doors right behind us as the gypsies finished rolling the van onto the deck. 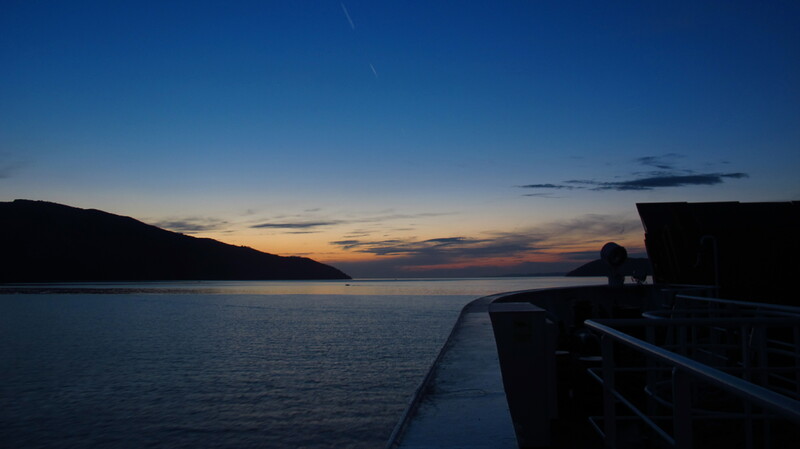 By that time it was pitch black out at sea, and as I had imagined earlier that evening on the observatory on the hill, the night sky was spectacular, thousands of stars twinkling above our heads as we made it back to the mainland. 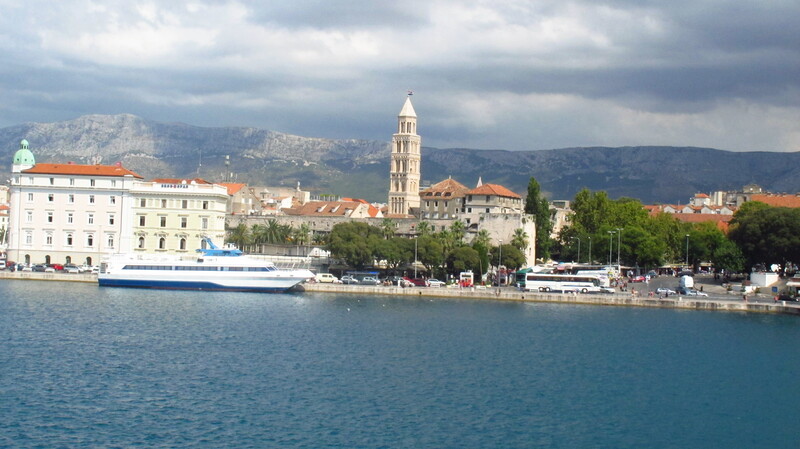 This entry was posted in Stroming The World 2013, Travel and tagged ferry, Hvar, Split, STW 2013 by Kilian. Bookmark the permalink.